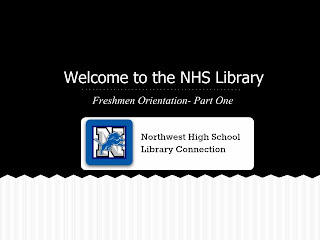 Freshmen Library Orientation takes over the NHS Library for four to five days every year. This year, my co-librarian Rhonda Dobbs and I are dividing up the orientation into two sessions. We just finished Part 1 during the last days of August. Part 2 is in the works for the last week of September. Why two orientations? One, we have over 2000 students in the high school which makes the 9th grade class over 500 kids. Two, we have learned that showing an orientation without student engagement is a total waste of time. Three, this year we wanted to include an assessment with the lesson. We wanted to showcase Reading Literacy - get the kids excited about the choice of books at the high school library. Fourth, we really need to get the 9th graders up to speed on the technology and research required for high school classes. Divide and conquer since we knew we couldn't cover both topics in one 45 minute lesson. During a 45 minute class period Rhonda presented a slide show with the basic information. Yes, I know most librarians don't like to talk about library rules and regs, but this is our first opportunity to explain how the high school library works. Having two librarians means one can lead off the information with the other one tossing in "stories" that connect to the slides. At the end of the slideshow, orientation shifted into high gear with a showing of book trailers. The book trailers gave the opportunity to share that the fiction collection is "more grown-up" at the high school. Topics for fiction can be more realistic than what the average middle high YA book contains. These trailers,curated from YouTube, connected the students to the next activity. Book Pass - the Power of Choice. When Rhonda and I were brainstorming for an activity for orientation, I knew there was something out there about passing books around with students sharing comments. Googling away the first hit was Scholastic's Book Pass. Good but not quite what I was searching for...knew there was something else tickling at my brain. Voila! Halfway down the page was Gwyneth Jones' Book Pass: The Power of Choice wiki. This reading activity was from way back in 2007 when our daring librarian brought it home from AASL conference in Reno. Thanks to Gwyneth documenting all the "good stuff". Rhonda and I adapted the activity to suit our 9th graders. Rhonda took the ideas and ran with it by collecting stacks of books enough for a class of 25 or more students to dig around in. Also, she started genre color coding our fiction collection last year so she made genre code sheets coded with color stickers for each grouping. Rhonda "borrowed" the Book Pass worksheet and adapted it to our library. Rhonda set up a timer on the big screen for the book review while I was in charge - with my big loud voice - to count down when the groups did musical tables after each book pass. After the three to four times switching tables, the students went to grab books for check-out. Even a few times kids were playing "Rock, Paper, Scissors" to see which one could check out a favorite from the tables. Library orientation lesson gave us information about our freshmen class' reading interests. We'll use their Book Pass worksheets as part of the Part Two session with them in learning more about Destiny Quest. Check out the Animoto video created from images snapped during orientation session. We also managed to add in a bit of library circulation statistics to share with the administration and the community. Great success with the Library Orientation, Part One! Jones, Gwyneth. "Book Pass: The Power of Choice! Reading Activity." Murray Hill Middle School Wiki. N.p., 15 Nov. 2007. Web. 20 Aug. 2013. <http://murrayhill.wikispaces.com/Book_Pass>. I'm so flattered that you dug into the deep vaults for this one! I don't do it every year anymore but seeing your awesome updates, now I may! Thank you! Gwyneth dear, good stuff never goes out of style! It worked beautifully with the kids...differentiated with all reading levels of books piled on the tables plus the whole learning style thing with them moving around the room. Thank you, Linda! This sounds great! !